Giving expression to "punishment and revenge", two imprisoned Iraqis - Sajida al-Rishawi, a would-be female suicide bomber, and a male al-Qaeda terrorist convicted in 2008 for killing a Jordanian - were sent to the gallows at daybreak today [Aljazeera]. sentenced to death by hanging by a Jordanian military court on September 21, 2006. She appealed against this conviction but her appeal was dismissed in January 2007. At the time of her execution, she was still engaged in the process of appeal of her sentence. Tamimi has never spent time in any Jordanian prison, and never will. Quite the opposite: she was honored with a reception in Jordan's Family Court in October 2011 when she returned home. (Perhaps because she has a family connection in the court system.) She has her own weekly television program [click for this past week's show] every edition of which is replete with advocacy and glorification of terror. They are recorded in Jordan by her friends and employers in the Hamas terror organization and beamed throughout the world on the Al-Quds TV Network. And she is free to travel throughout the Arab world which it seems she does often, giving lectures and being an honoured guest. Oh, yes - and in December she was proclaimed the "Success Model" of the students at the Arab world's most important graduate school for journalists, an institution modeled on the Columbia School of Journalism and founded by the woman previously known as Rym Brahimi who graduated Columbia and who then spent years working as an on-camera reporter for CNN. 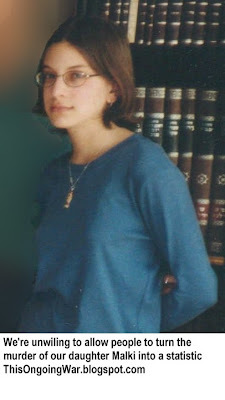 As Princess Rym Ali, she is now the king of Jordan's sister in law. That is not how it worked out. 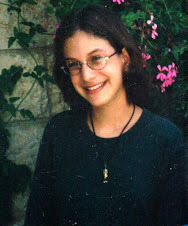 She was one of 1,027 terrorists set free in the extortion-driven 2011 Gilad Shalit Israel/Hamas transaction, despite a campaign we personally waged for years. We urged our government to stand firm, to not give in, to keep this particular sociopath behind bars so that justice could be done. She is the murderer of our 15 year-old daughter Malki. And in the end, she walked free. Today she is a globally-influential instigator of jihadist terror - an icon of hatred. What Jordan - a sovereign state at least half of whose population defines itself as Palestinian Arab, and ruled by a dynastic family from Saudi Arabia - ought to do with its terrorists is emphatically not our concern. Jordan's laws that purportedly outlaw terrorism [see this little-known aspect of the sorry mess for instance] don't get the critical attention in the West that they richly deserve. But that's a far larger problem than we can address. However when one of that country's most celebrated education institutions is found to be incubating lethal support for jihad, terror, lethal hatred while getting lavishly backed by Western governments, NGOs and corporations, that's a real problem. Not for Jordan - for the rest of us. By tolerating this, and giving support, comfort, guidance, funding, sponsorship, encouragement and what appears to be an absurdly naive and uncritical acceptance of a dangerous Jordanian tolerance for certain kinds of jihad directed at certain kinds of victims, the major Western NGOs and respected governments who continue to do it ought to be brought to account by their citizens and donors. A very great deal depends, as we have said often, on being right about how to deal with terror and its promoters. Postscript: If you are interested in knowing who the JMI's Donors and Partners are and what they are and are not doing about this scandal which gets their cash, sponsorship and backing, we are happy to share the pre-publication details. We are preparing to publish an expose, but for now, on request [email us by clicking here], we will share what we know. It's a revealing, and disturbing, tale. Excellent article. It is indeed sad to see such hypocrisy but that is to be expected from the Arab world. Western government funding for Jew-hating organizations is an old story that will sadly continue. Why on earth is this woman allowed to walk free? It sounds like Jordens fault to me, it is not fair to anyone to allow this to happen, she needs to be hanged, asap. How does her freedom help with the war on terror? It does not, at all.